There are so many people who make this event successful….the participants…the people who help behind the scenes (and sometimes in front of the scene) – to name just a few….Kimberly, Emily, Susanne, Diane, Debbie, Margaret….oh, the list goes on….and to all those who help the break-down be so smooth and efficient. And many thanks to Marconi Conference Center. There are at least two of us reporting on this past weekend…check out Kimberly’s Craftini as well as Facebook where comments are appearing. And Bonnie and I will be updating Raverly soon. Oh my goodness…my girl puppy thinks she can knit…I just found her with a couple of skeins of MaggiKnits linen. She doesn’t realize that this yarn is better if you only use one skein, at a time, instead of two! The retreat began for me on Thursday evening as I headed for the Oakland airport to pick up Sally (Melville). She flew in from Ontario via Denver..her plane was 1 1/2 hours late. For her it was 1:30 am when she arrived. We met, moved quickly from the airport and headed for Kimberly’s home where she graciously offers a private room with bathroom in her home for Skein Lane Studio visiting teachers. Thank you again Kimberly! 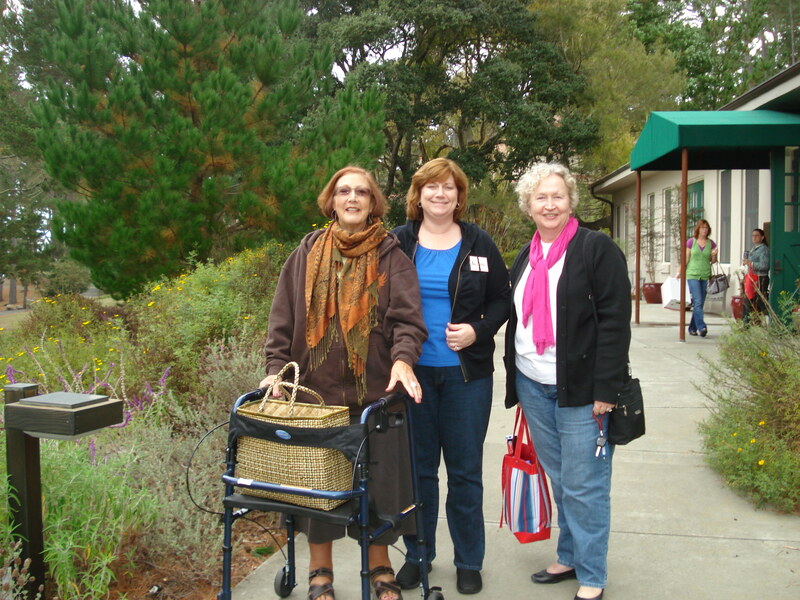 On Friday morning the contingency of Kimberly, Sally, Sheri, and Jan – headed off to Marconi Conference Center with a planned stop in Pt Reyes Station. At the same time I picked up Nancy (Bush) at the same airport that I traveled to the night before – Oakland – her flight was on time (I was late) and we headed off to meet Kimberly’s caravan for lunch at The Pine Cone Cafe in Pt Reyes. 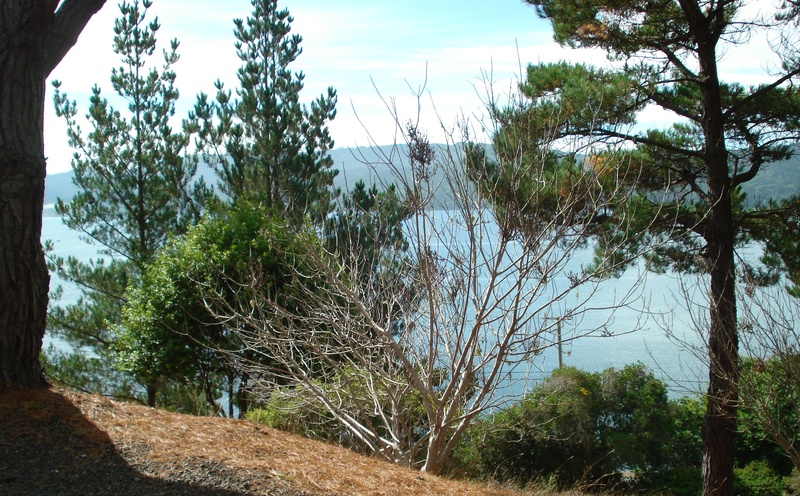 Next stop – Marconi Conference Center. We, as knitting retreaters, were extremely fortunate to have the unusual and wonderful blend of these two national knitting instructors for our annual knitting retreat. Nancy offered Estonian Lace and Sally offered Flatter to Fit. I believe we all walked away with new knitting skills and knowledge. I have been a fan and friend of both of them for years. 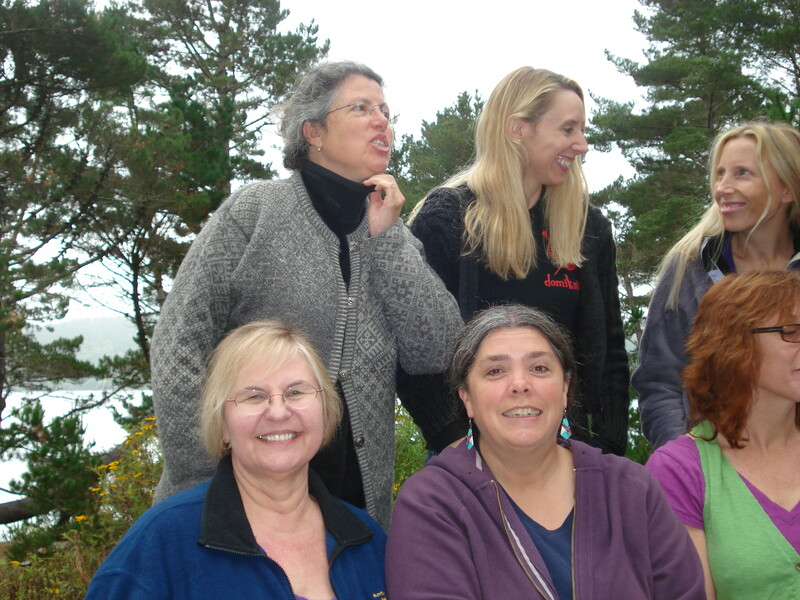 I have such fond memories of my first retreat with Nancy at Whidbey Island some 10 years ago….and I became aware of Sally when I attended a TNNA show in San Diego some 10 years ago as well. I took one class and then groveled to get into the rest of them…I got three out of four. I admire and respect both of their knitting styles, have learned so much from them, and include many of their tips and teaching in my own teaching. The retreat started officially on Friday evening with Marlee of Black Mountain Weavers and Mimi of Windrush Farms giving us their “dog and pony” show as I like to call it…but more seriously it is a presentation of fibers, design, sheep, and farm life. I am in awe of both of these women and what they accomplish in the world of fibers as well as being people that you want to know. We then reaquainted ourselves…old friendships and new friendships. At this retreat Nancy taught Estonian Lace and Sally taught Flatter to Fit. We concluded on Sunday morning with a mentoring session that both mentored. Nancy has recently published Knitted Lace of Estonia and Sally’s most recent book is Mother-Daughter Flatter to Fit. More to come….but in the meantime here are a couple more photos.